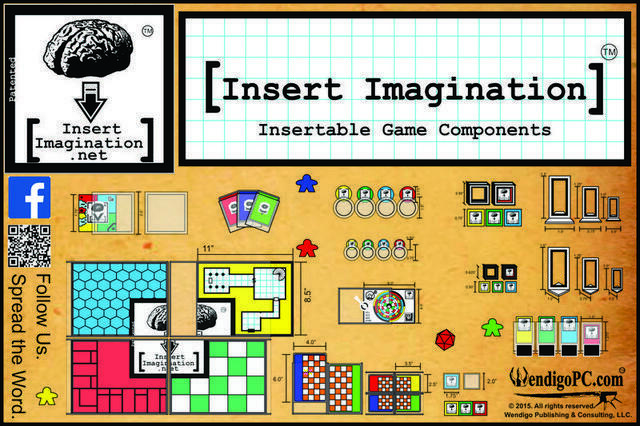 Insert Imagination (TM) is a tabletop (board game) design and prototyping system. It consists of various components that you can insert your graphics into. Insert Imagination is perfect for designing, developing, and prototyping games. Insert Imagination is also perfect for self-publishing crowd-funded smaller print runs, POD (Print-on-Demand) production, and beefing up your PNP (Print and Play) games. Insert Imagination is a great for DIY crafting, educational, and gamification projects. Insert Imagination is scalable, interchangeable, reusable, and multi-functional. Insert Imagination works for all types of games including Board Games, Card Games, Role Playing Games, and Party Games. Insert Imagination brings tangibility, consistency, efficiency, and customizability to your gaming table. When it comes to constructing prototypes for fun and/or profit, [Insert Imagination] components allow the game's creators and developers to focus their efforts on developing their rules, mechanics, graphics and play testing their game, rather than wasting time and effort constructing the physical components of their prototype, or ordering costly copies from traditional print on demand services. With [Insert Imagination], making a change to a prototype is as simple as reprinting the graphic insert and swapping it out. When it comes to print-and-play games, [Insert Imagination] offers gaming enthusiasts an aesthetic, consistent, cleanly, efficient, economical, and reusable system for printing and assembling their favorite games. (1) Print On Demand Capability. Whether customers order 1 copy or 100's of copies of a game, they can be constructed domestically on-site, thereby avoiding the need for a third-party manufacturer and the costs and delays associated with separate manufacturers. (2) Economics of Scale and Flexibility. Ordering large quantities of "blank" [Insert Imagination] components allows self-publishers to keep costs down, without committing the materials to a particular game title, until such time as a game is actually ordered and paid for. (3) Avoid Minimum Production Orders, Delays, and Reduce Storage Costs. It is not uncommon for manufactures to require minimum orders of 1500 to 2500 units for a single production run, and to take 90 days or more to manufacture and actually ship the order to you. Then you are forced to store the unsold copies somewhere. However, with [Insert Imagination] you store only your blank components on hand, which can be used for any game title ordered. Moreover, [Insert Imagination] allows you to self-manufacture and ship the game the same day it is ordered. (4) Electronic Distribution and Component-Free Capability: In addition to traditional manufacture, [Insert Imagination] enables self-publishers to reduce their manufacturing and distribution costs even further should they opt to sell only the graphic inserts/literature (or electronic files containing such) needed in order to play the game. After all, once a customer already owns enough Insert Imagination components required to play the game, there is no need for self-publishers and customers to waste money on duplicate physical materials. In sum, [Insert Imagination] allows much of the risk/costs associated with manufacturing a specific game title to be mitigated, since all of the system's components can easily be repurposed to any game title by merely changing out graphic inserts. Additionally, [Insert Imagination] allows self-publishers to print on demand, each unit as needed, in-house, thereby allowing them to manufacture and ship on the same day, as well as free-up capital that would otherwise be tied-up in larger production runs that inevitably sit on a shelf while waiting to be sold (all the while incurring storage fees). Please contact us for further details regarding licensing fees and terms for using [Insert Imagination] as a print on demand and/or self-manufacturing system. If you would like to acquire Insert Imagination components for making prototypes and demo copies of your game please join our Insert Imagination Group for details! As you know (and many of your customers will appreciate) "Reuse - Repurpose - Recycle" is the motto of the Green Movement. At its core, [Insert Imagination] enables game developers, manufacturers, and players to potentially reduce their carbon footprints by reusing and repurposing their [Insert Imagination] gaming components from game to game.